The promotion also seems to encourage higher hot dispensed sales during the rest of the week and Big Mart intends to continue the offer for the foreseeable future. Bundling also works well for Big 10. On a regular basis, the stores offer coffee-and-doughnut, coffee-and-fruit and coffee-and-breakfast-sandwich or burrito specials. 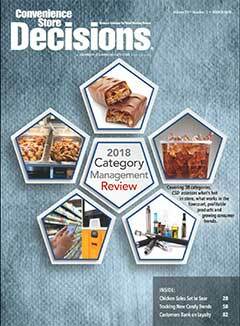 At the same time, dispensed iced coffee sales increased 24% in 2018 versus 2017 and the stores saw a 10% lift in RTD cold coffee sold out of the cooler. Hager attributed the higher cooler sales to the addition of Dunkin’ Donuts, McCafé and more Starbucks selections. To continue to capture more cold coffee sales during this trend, the stores will be moving the RTD products away from the milk door and placing them with the energy drinks. The company is also planning to add STōK cold brew coffee shot singles to its offerings. While Hager acknowledged that there may be some loss of hot dispensed customers to the cold beverage category, she is also convinced that the cold beverages are appealing to new customers as well. Big 10 offers four flavors of hot dispensed coffee—Classic, Premium, Dark Roast and Decaf—along with five flavors of Lipton tea bags. To satisfy customers’ desire to customize their coffee, the bar features eight flavors of International Delight creamers including LTO varieties that are rotated in and out throughout the year. To maintain freshness, coffee is replaced on a strict three-hour schedule. For three of the stores where coffee sales are historically slower, the company is looking at replacing existing equipment with bean-to-cup machines. RTD and dispensed cold coffee beverages haven’t had an impact at the 35 FastLane convenience stores in Missouri, but, said Kalen Frese, food service director, customers are looking for “fancier and exotic” varieties and customization of hot dispensed beverages with a variety of sweeteners and creamers. technology, the program has been a success. For the dominant brewed drip program, the stores start with four or five pots in the morning, then scale back as the day progresses. Cappuccino machines have been reduced from eight heads to six or five, depending on the individual store’s sales. “The new look advertises our hot dispensed area and overall stores better,” Frese said. From October through March, promotions pair hot dispensed beverages with other products such as granola bars, cookies and fruit at special prices. At its 10 Long Island, N.Y. locations, Busy Bee Convenience Stores keeps its Chock Full ‘O Nuts coffee prices low to encourage customers to come in every day, said general manager Mark Coner. In some of the stores, any size coffee (12-, 16- or 20-ounce) costs only 99 cents. Bundles also add value to the offering. For example, an egg sandwich that would cost $2.79 alone goes up to only $2.99 when bundled with a cup of coffee. The number of varieties offered varies according to store size, but may include, in addition to the regular blend, the standard favorites French vanilla and hazelnut. There is usually also a seasonal LTO such as pumpkin spice or cinnamon crumb cake.